Mill-Max has added a micro-miniature option to our Organic Fibre Plug® receptacle lineup. 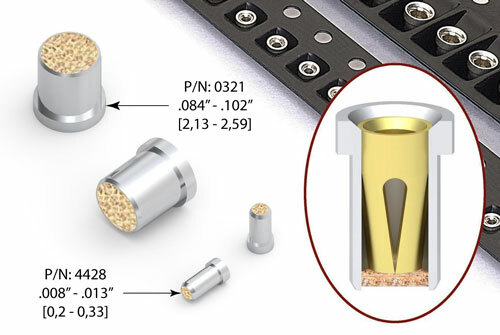 The newest Mill-Max socket receptacle, 4428-0-43-15-04-14-10-0, is our tiniest OFP® receptacle ever. Optimized for high-density packaging down to 1 mm pitch, this micro-miniature, ultra-low profile receptacle accepts .008"-.013" (0,2 - 0,33mm) device leads or mating pins, comes packaged in bulk or on tape & reel, and can be soldered into a hole as small as .030" (0,76mm). Mill-Max Organic Fibre Plug® (OFP®) receptacles and sockets are interconnect sockets for through-hole soldering into printed circuit boards. These open bottom interconnects are fitted with paper plugs to prevent solder, paste or flux from contaminating the internal contact during the placing and soldering process. When the device/mating lead is plugged into the receptacle the OFP® is knocked out allowing the mating lead to pass through the fingers of the internal contact and make a reliable electrical connection. 16 sizes/styles are now available, 13 have standard tape & reel packaging which permits through-hole components to be placed simultaneously with surface mount parts on pick-&-place assembly lines - eliminating the need to hand place the receptacles in an additional manufacturing step. The OFP® barrier permits the sockets to be vacuum picked from the tape prior to placement in a hole in the circuit board. The knock-out-bottom feature enables these sockets to be made relatively short compared to many similar receptacles. The reduced length provides two advantages: the receptacles can stand upright and stable in a carrier tape pocket and the protrusion through the PCB is minimal - especially important when working with SMT boards. The open bottom receptacle design eliminates the need to trim long device leads that would otherwise bottom out in a closed receptacle design and also makes them ideal for low profile board stacking applications via the ability to pass through.